Roger Serrano from Spain and Michelle Flipo from Mexico won the XTERRA Denmark off-road triathlon elite titles in Mons Klint on Sunday, September 9, 2018. Sixteen races this season in Europe and not even one race with rain. We had perfect conditions all year and today was no different in Denmark. The race is in a beautiful forest, surrounding the Geo center of Mons Klint, and is famous for the 497 stairs athletes need to run up twice, once to T1 and the second time on their way to the finish. We started this morning at 10am on the bottom of the cliff in 17° water, no big waves but still a little bit choppy, enough to make this swim quite hard today. Pros had a one-minute head start, with a quiet seal, watching them from his rock, it was the attraction of the start and hopefully we will have so good pics about it later. Very quick a group of four took off and passing close to the shore ending the first loop, Max Chane was leading with Sam Osborne on his foot, Michelle Flipo in 3rd and leading for the women, and Roger Serrano in 4th. François Carloni was already 30/40’’ back with Peter Lehmann. Coming out of the water is a bit tricky here, first to manage your way around some rocks, then run on a rocky beach for 20 meters and finally up the wooden stairs. Some athletes decided to run without shoes, but most put some shoes early on the stairs to be safe for this very long transition. Serrano was leading at the top of those stairs and put the fastest swim split of the day in 20’10’’ with Osborne on his feet. Chané was a few seconds back. Carloni was 4th 1’35’’ back. Peter Lehmann was in 5th another 30’’ back. Already some big gap in this swim today and this 5’ transition did impact the race as Chané lost the lead on those stairs today. After the first twisty mountain bike loop, Serrano and Osborne were together leading the race, Chane was alone 45’’ back, Carloni was still in 4th 2’ back and 5th was now Rui Dolores 3’30’’ back, he passed Peter Lehmann who broke is chain on this first loop. The 10k run had two loops, with one common session of about 1,5 km but than it was two different terrains. The first was all in the forest, with lots of up and down, with some hard climbs. The second loop athletes had to go down to the beach, run about 2km on rocky shoreline before going up those crazy stairs again. Serrano started the run leading with Osborne still on is feet, and from here we were thinking that Osborne had the victory in pocket as three weeks ago in Germany Osborne ran way faster than Roger. Chane was still in 3rd position but lost some time, he was now 2’10’’ back, not in his best shape today from what he told us, but also alone not easy to focus when you never seen anybody during almost the all bike. Carloni was 4th, 4’ back from the lead and Dolores still 5th at 5’. The fastest bike split went to Xavier Dafflon today in 1 :21 :25 moving up to 7th place with this performance. After the first loop Osborne took the lead, but Serrano was only 10’’ behind. Carloni made his move up the podium passing team mate Chane and able to control Dolores. On the finish line, we were amazed to see Serrano winning this race, proving that it was not only about running speed, but about energy left to climb those stairs he put the fastest run split in 43’23’’. Osborne came in second but lost almost 2’ on those last stairs and collapse crossing the finish line, completely out of sugar! Carloni managed to stay on the podium, Dolores moved up to 4th passing Chane who ends up 5th. In the women's race, After the first swim loop, Flipo was leading for sure as in the lead pack with the men, second position was for Heidi Thranum from Denmark. Brigitta Poor, was a little back in another group. Flipo was still in 4th overall on top of the stairs, managing here pace, but with already a huge lead for the woman. With her 20’16’’ swim time she had 1’35’’ on Danish Thranum but gain 1’ more on stairs and had 2’30’’ at this point on woman’s lead. Poor was in 3rd right behind Thranum with the best stairs climb. After the first MTB loop, Flipo was still leading and with and quite comfortable as she was about 3’aheand of Poor who had a big crash and rode her bike for a while with her handle bar completely bent and finally had some help from other competitors with a tool to fix it. Lizzie Orchard already made his move on the podium and was riding in 3rd place at this points, KM 15, only 1’ back of Brigitta, making some time on the Hungarian. Starting the run for women, Flipo still had a solid lead of about 2’ on Poor and Orchard who put the fastest bike split in 1 :37 :49. Thos two started together the trail run. Behind Samantha Kongsford and Thranum were in 4th and 5th with quite a big gap in between each other. Flipo was able to stay on the lead and win the race but it was close, as she also had hard time to finish and behind Poor who put the best run split in 51 :05 was coming back. So Poor stay in 2nd place today, and Orchard finish 3rd, not her best run as she was still little bit injured, but for sure happy to be on the podium today. Today it was the last race, so of course the final, when we gave the Tour medals and Euro Tour winner shirt, so for a lot of athletes it was more than a race, it was the end of a long season. For the Elite women, we knew before the results as the top 3 was already done before this race. Carina Wasle did an amazing season, she didn’t race today due to an injury from last week race in Norway and gave Nico a good help on the FB live instead. 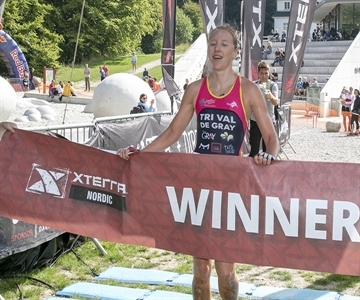 Brigitta Poor with 7 wins this year took the second place, and for her last season in XTERRA Helena Karaskova Erbenova took the third place.